The Messenger - Who deserves State Medals and Orders? Who deserves State Medals and Orders? The Institute of Development of Freedom of Information (IDFI) has released information about how many medals and orders have been granted by Georgia’s Presidents to various people. The Georgian government awards medals and orders to individuals for defending the homeland, acts of heroism and courage during battles for the protection and unification of the country, or exceptional personal contributions to state development projects. The decision to award medals and orders is made by the Georgian President. State awards can be given to any Georgian citizen, or foreign citizens and persons without citizenship with the President’s decision. The IDFI said it had requested information on state awards (orders and medals) issued by Georgian Presidents in 2003-2015 from the President’s Administration. 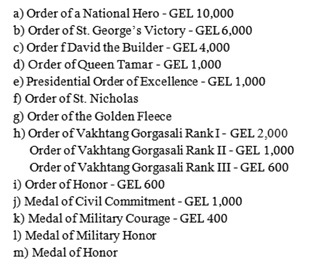 According to the provided data, the Georgian Presidents had issued a total of 11,595 state awards in 2003-2015, including 5,525 Orders of Honor, 2,541 Medals of Honor, and 1,160 Medals of Military Courage. During this period, the largest number of state awards was issued during the last years of Mikheil Saakashvili’s presidency; 2,681 in 2012 and 1,926 in 2013. Many state awards of high importance that were rarely being issued previously were issued extensively in 2013. For example, in 2013 the President awarded 11 Orders of a National Hero, 30 Orders of St. George's Victory, 2 Orders of David the Builder, 39 Orders of Queen Tamar, 157 Presidential Orders of Excellence, 20 Orders of St. Nicholas and 56 Orders of Vakhtang Gorgasali Rank I. The orders and medals the people are granted with are naturally important, but some it should be were awarded with certain medals for just singing a single song at an important event. State medals have important national significance and value, and this value must not be depreciated through giving them to those who do not deserve them.